LOCATION.--Lat 42°05'11", long 76°48'04" referenced to North American Datum of 1983, Chemung County, NY, Hydrologic Unit 02050105, on right bank 580 ft downstream from bridge on Pennsylvania Avenue at the north end of George Place at Elmira and 1.0 mi downstream from Hoffman Brook. GAGE.--Water-stage recorder and crest-stage gage. 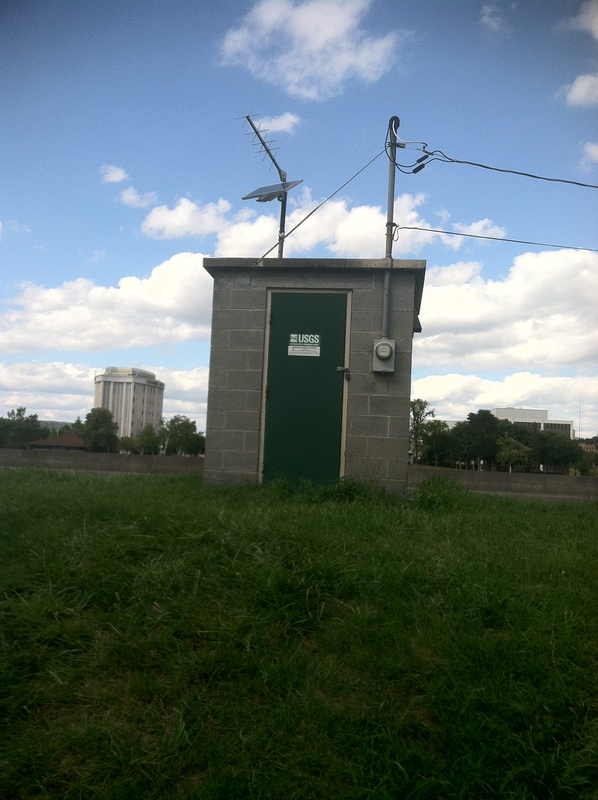 Datum of gage is 833.65 ft above NGVD of 1929 and 833.05 ft above NAVD of 1988 (VERTCON). REMARKS.--High flows significantly regulated by upstream reservoirs: since March 1940, by Arkport Reservoir (01521000); since June 1949, by Almond Lake (01523000); since Nov. 1979, by Tioga Lake (01517900) and Hammond Lake (01518498); and since Dec. 1979, by Cowanesque Lake (01519995). From 1931-98, a large part of flow from 45.5 mi² of drainage area upstream from Lamoka Lake on Mud Creek, an upstream tributary, had been diverted into Keuka Lake (Oswego River basin) for power development. Diversion upstream from City of Corning and Town of Horseheads for municipal supply, which may include water from several municipal and industrial wells upstream from gage. EXTREMES FOR PERIOD OF RECORD.--Maximum discharge, 71,000 ft³/s, Jan. 20, 1996, gage height, 18.51 ft, from floodmark; minimum discharge, 109 ft³/s, Sept. 18, 2016; minimum gage height, 0.79 ft, Sept. 17, 18, Oct. 16, 2016. EXTREMES OUTSIDE PERIOD OF RECORD.--Flood of June 23, 1972, reached a discharge of 235,000 ft³/s, computed by slope-area measurement at site (station 01530303) 6 mi upstream.